A digital terrain model generated from a stereo pair of images provides this synthesized, oblique view of a portion of the wall terraces of Mojave Crater in the Xanthe Terra region of Mars. This view, in which the vertical dimension is exaggerated three-fold compared with horizontal dimensions, shows the ponding of material backed up behind massive wall-terrace blocks of bedrock. 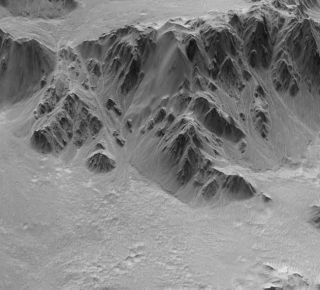 A dramatic 3-D view rendered from Mars orbiter data revealsthe highs and lows of Mars' Mojave Crater. In the new image of a portion of the crater's walls, basedon terrain modeling from NASA's Mars ReconnaissanceOrbiter data, the vertical dimensions are exaggerated by three timescompared to the horizontal dimensions. The resulting images look like the view froma low-altitude aircraft. This enhanced view shows material that has ponded and isbacked up behind massive blocks of bedrock in the crater's terrace walls.Hundreds of Martian impact craters have similar ponding with pitted surfaces. Scientists believe these "pitted ponds" arecreated when material melted by the crater-causing impacts is captured behindthe wall terraces. Mojave Crater, one of the freshest large craters on Mars, isabout 37 miles (60 kilometers) in diameter. Analysis of the crater suggests itmay be as young as about 10 million years, very young for a crater of thissize. Because it is so fresh, it helps scientists better understand thefeatures of other Martiancraters. Other craters of this size generally have already beenaffected by erosion, sediment and other geologic process. Fresh craters likeMojave reveal information about the impact process, including ejecta, meltingand deposits.